Einsteinium, a transuranic actinide, is one of many elements to be identified by a team led by Albert Ghiorso. It was discovered among debris that was swept up with the fallout from Ivy Mike, the first successful hydrogen bomb test, in 1952. Due to the Cold War, its discovery was kept secret until 1955. The name einsteinium was chosen to honor Albert Einstein. 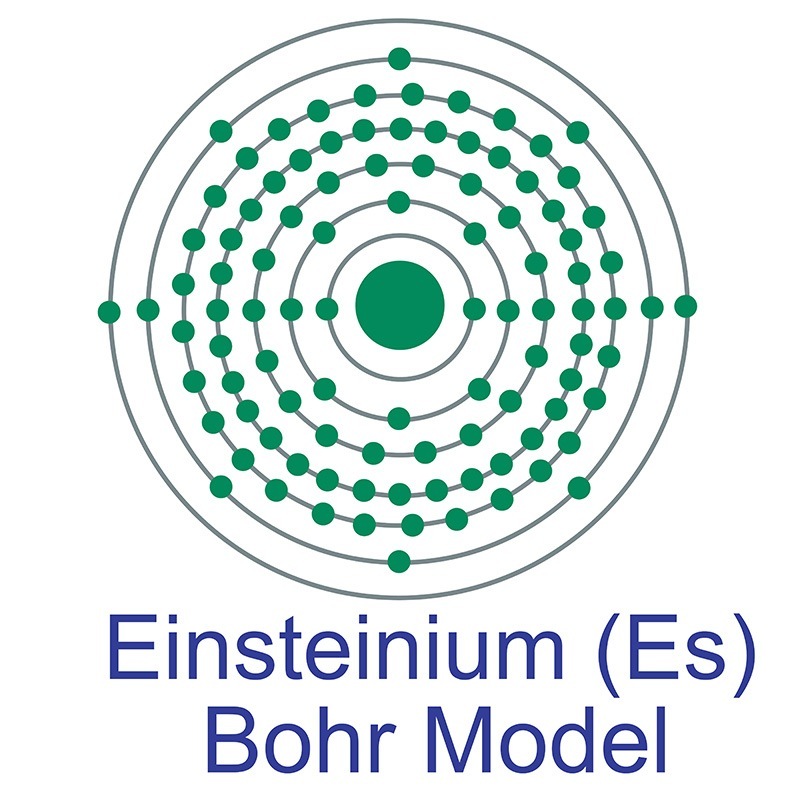 Today, the most common isotope of the element, einsteinium-253, is synthesized in a few dedicated high power nuclear reactors from the decay of californium-253, while other isotopes are produced in small amounts by bombarding heavy actinides with light ions. The most stable isotope of the element, einsteinium-252, has proven difficult to produce in significant quantities, which has hampered study of einsteinium's physical properties, though it is know to be a soft, silvery, paramagnetic metal. The high radioactivity of einsteinium-253 produces a visible glow. As the most easily produced isotope of einsteinium is very unstable, commercial uses for the element have not been developed. Einsteinium is therefore used exclusively in research contexts, primarily in the production of other transuranium elements. Notably, the element mendelevium was first synthesized using einsteinium. Einsteinium is a Block F, Group 3, Period 7 element. The number of electrons in each of einsteinium's shells is 2, 8, 18, 32, 29, 8, 2 and its electronic configuration is [Rn] 5f11 7s2. The einsteinium atom has a radius of 186.pm. In its elemental form, einsteinium's CAS number is 7429-92-7. Einsteinium was discovered at the Lawrence Berkeley Natinal Laboratory in 1952 and named in honor of Albert Einstein. Einsteinium was the seventh transuranic element of the actinide series to be discovered. Einsteinium information, including technical data, safety data and its properties, research, applications and other useful facts are discussed below. Scientific facts such as the atomic structure, ionization energy, abundance on Earth, conductivity and thermal properties are included. Einsteinium is an artificial element. It has no stable isotopes.